Attention! To work according to schedule requires addon vtcron. 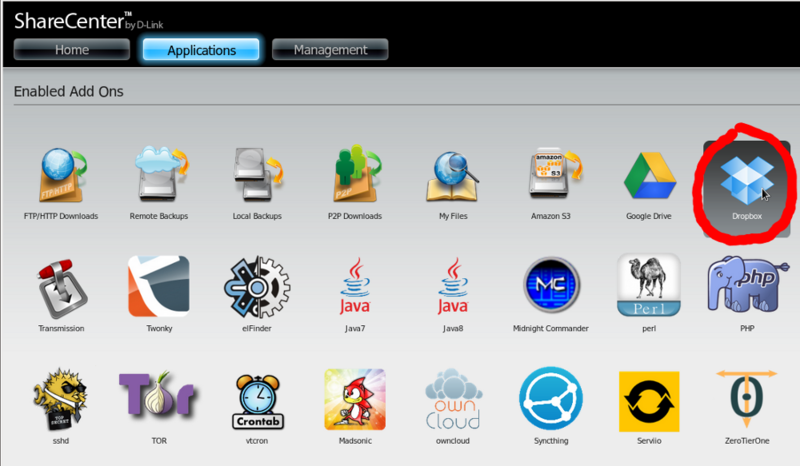 Download and install the vtcloud Add-On. Click the link for the vtcloud web interface and configure it. I have a DNS 320L and have been trying for the last week also to sync my dropbox and box accounts with it. I am actually not sure that it can be achieved with vtcloud. So far, I am not even managing to sync one account (I got the directory structure at one point but never got any file sync on the NAS). Any advice on how to do it with or without vtCloud? There are one problem with dropbox sync. It uses www.dropdav.com to connect to dropbox. So it's necessary to register and connect dropdav to your dropbox account. In vtClud you should enter dropdav login and password, not the dropbox one. For Dropbox in the latest firmware has built a client. Works great. With regards vtCloud - Blasse rightly said, all the action in just over Dropdav. The title is written DROPBOX, but hyperlink to www.dropdav.com ! do you mean dropbox has been added to the standard firmware or do you still need to use vtClud? For "embedded" is not required. But in November 2015 the Dropbox, "embedded" in the firmware has not yet been. not sure what you mean by embedded. I've just updated my firmware but still don't see a dropbox app. I understand I may need to use VTcloud but it says I first need vtcron and I cant even see how to install that. I've never installed any addons on this before. Can anyone advise? ive spent all morning trying to get vtcloud working (it still doesnt!) and then just logged on to see your post! I certainyl dont have that dropbox app in my list of embedded add ons. Any idea how I could get it? Again, I have a DNS320L. Is that what you have it on? Good night, I'm using the version 1.08 04/20/2016 however when trying to connect to the dropbox of the "connection error" message and I can not login to the account, any suggestions? do you have a DNS-320L? How do you find out your firmware version?